You cannot use the Swift types Any or AnyObject anywhere in your solution. We made the result, description and resultIsPending vars non-private API in Assignment 1. That means we signed up to continue to support them even though we are now adding a new feature (variables) in this assignment which sort of makes them irrelevant. Really what we want to do is deprecate these (you’ll see all sorts of deprecated iOS API in Xcode), but for now we will keep the old result, description and resultIsPending vars around and just implement each of them by calling evaluate with the argument nil (i.e. they will give their answer assuming the value of any variables is zero). However, do not use any of these vars anywhere in your code in this assignment. Use evaluate instead. The complete code for the assignment #2 task #5 is available on GitHub. Note that this takes an Optional Dictionary (with Strings as keys and Doubles as values) as its argument and that that argument defaults to nil if not supplied when this method is called. Also note that it returns a tuple (the first element of which is an Optional Double). This method is not mutating and you are not allowed to make it so. If a variable that has been set as an operand is not found in the Dictionary, assume its value is zero. This must do exactly what you would imagine it would: it inputs a “variable” as the operand (e.g. setOperand(variable: “x”) would input a variable named x). Setting the operand to x and then performing the operation cos would mean cos(x) is in your CalculatorBrain. 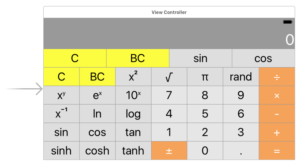 Your UI should always be in sync with your Model (the CalculatorBrain). Do not change, remove or add any public API (i.e. non-private funcs and vars) from your CalculatorBrain from Assignment 1 except undo() and as specified in Required Task 3 and 4. Also, continue to use the Dictionary as CalculatorBrain’s primary internal data structure for performing operations. Make one of your operation buttons be “generate a random double-precision floating point number between 0 and 1”. This operation button is not a constant (since it changes each time you invoke it). Nor is it a unary operation (since it does not operate on anything). 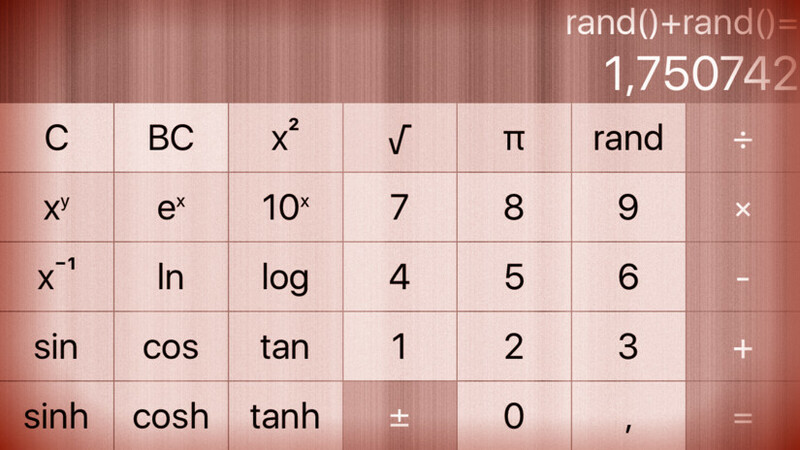 Probably the easiest way to generate a random number in iOS is the global Swift function arc4random() which generates a random number between 0 and the largest possible 32-bit integer (UInt32.max). You’ll have to get to double precision floating point number from there, of course.